Andrew Charles Thomas Gomarsall MBE was born in Durham on 24/07/1974 and was introduced to the game of rugby aged 6 when his father Jack enrolled him in the Doncaster RFC minis, before going on to play for Bicester RFC. He attended Bedford School and Oxford Brooke’s University, during which time he sprang to prominence when he captained England Under 18’s to the 1992 Five Nations Grand Slam, their first at that level for 11 years. He continued his progression up the representational ladder over the next few years with selection for England Colts, England Students, England Under 21’s, England Emerging Players and England A. This was made all the more impressive given the fact he had to undergo major back surgery early in his career. Fast becoming a player renowned for his expansive style of play and exceptional service from scrum half, he was recruited by Wasps RFC in 1993, making his first team début against Newcastle Falcons on 17/2/1994. He got his first taste of the full England set-up as a 20 year old novice during the 1995 World Cup in South Africa, when then England head coach Jack Rowell called him up from the England A tour of Australia as emergency cover for their winning quarter final against the Wallabies after Kyran Bracken was injured, before releasing him a week later. Just as the game turned professional Gomarsall made his full international début for England against Italy in an Autumn international at Twickenham on 23/11/1996, scoring two tries in the process. Later that season he helped England achieve the Triple Crown during the 1997 Five Nations, playing in three games and scoring tries in victories over Scotland and Ireland. This led to his selection for the end of season England tour to Argentina, where he came off the bench twice to add to his ever growing tally of international caps. One of Gomarsall’s final acts for Wasps was to help the club lift the 1999 Tetley’s Bitter Cup after defeating Newcastle 29-19 at Twickenham. This was made even more satisfying having been at the club when they lost both the 1995 Pilkington Cup final to Bath and the 1998 Tetley’s Bitter Cup final to Saracens. After six years, 82 games and having scored 15 tries Gomarsall left Wasps in 1999 for a very brief spell at Bath, where he played just two games before joining Premiership strugglers Bedford Blues to become captain, having held talks with Leicester and Stade Francais. A difficult 1999-2000 Premiership season saw Bedford relegated from the Premiership. Despite this difficult time he was still performing well enough to earn an England recall having not been selected since 1997, a period that saw him miss out on selection for the 1999 world cup. He started on the bench throughout England’s 2000 Six Nations campaign, coming on once in the victory over Italy in Rome, but knee surgery forced him to miss the end of season tour to South Africa. Unwilling to drop down to the second tier of English rugby, with his England career in mind, he signed a two year contract with Gloucester in June 2000, having once again also held talks with Leicester. In his second season at Gloucester he proved a key figure in helping the club finish third in the Zurich Premiership table before starting in the 28-23 playoff final victory over Bristol Shoguns at Twickenham, earning the cherry and whites a wildcard European qualification after Leicester finished top of the table as champions. 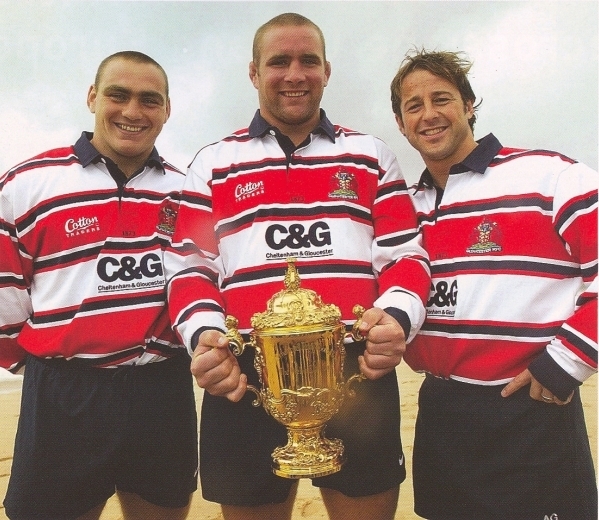 In April 2002 Andy Gomarsall ended speculation about a move away from Gloucester by signing a 3 year contract at Kingsholm, despite being overlooked at the beginning of the season as Frenchman Dimitri Yachvili took the limelight. Following his move to Gloucester Gomarsall’s England career had once again stagnated after a period of 27 months not being selected. This ended in 2002 when he was selected in the summer touring party to Agentina, playing in the 26-18 win over the hosts in Buenos Aires, before coming off the bench and kicking two conversions in a 53-3 victory over South Africa at Twickenham in November. Having been signed by Philippe Saint-Andre, Gomarsall was re-united with his former head coach at Wasps Nigel Melville when he was handed the reins at Kingsholm, and under his guidance the club started to build some momentum. 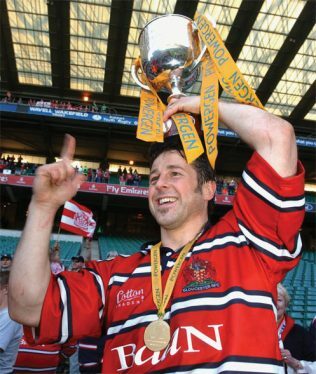 Gomarsall started in the 40-22 2003 Powergen Cup final victory over Northampton at Twickenham, as Gloucester lifted the trophy for the first time since 1982. By the end of the 2002-2003 season he had helped Gloucester finish 15 points clear at the top of the Zurich Premiership table for the first time in the clubs history and thereby reach the inaugural Premiership final to decide who would be champions. Unfortunately, the table topping cherry and whites team including Gomarsall were emphatically beaten 39-3 in the Twickenham show piece. Gomarsall maintained a presence in the England set up during the 2002-2003 season, starting on the bench in the victories over Wales and Scotland in what was a victorious Grand Slam campaign. Following an impressive season at club level he sealed his place as one of three scum halves selected by then head coach Clive Woodward in England’s 2003 World Cup squad, with a strong performance in their 43-9 defeat of Wales at the Millennium Stadium in a World Cup warm up match. During the tournament in Australia, which England entered as strong favourites having dominated international rugby for several years, Gomarsall was used as a squad player only featuring in the pool stages. He was an unused substitute during victories over South Africa and Samoa, came off the bench in the victory over Georgia, before starting the final pool game against Uruguay in which he scored two tries in a 111-13 victory. England went on to lift the Web Ellis Cup for the first time after an exhilarating 20-17 victory over hosts Australia after extra time in Sydney. Having contributed to such a huge achievement for English rugby, Gomarsall was awarded an MBE in 2004. After a number of post world cup retirements by senior members of the England squad he was becoming one of the more experienced players in the England set-up and was named as vice captain for the non-cap game against the New Zealand Barbarians in December 2003, before starting two and being named as a replacement for three of England’s games during the 2004 Six Nations as England finished third. At the end of the 2003-2004 season he was named vice captain for both the non-cap game against the Barbarians at Twickenham and the England A squad for the Churchill Cup held in Canada, which they finished as runners up after losing to New Zealand Maori in the final. Gomarsall ended 2004 as new England head coach Andy Robinson’s first choice scrum half, starting all three of his countries Autumn tests. Unfortunately, having now amassed 23 international caps the defeat to Australia signaled another hiatus from the national team. At the end of the 2004-2005 season he started the 24-16 Zurich Premiership Wildcard defeat to Saracens at Twickenham, who claimed the last Heineken Cup place available for the following season as a result. 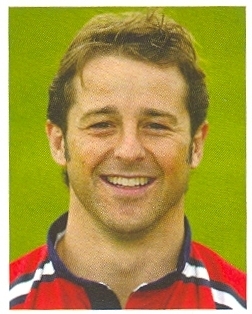 Nigel Melville parted company with Gloucester in May 2005 after a poor season, which saw the club win just five games after Christmas and only qualify for the European Challenge Cup. This signaled the end of Gomarsall’s time at Gloucester after four years at Kingsholm. He moved up the M5, signing a three year deal with Worcester Warriors. Things began badly at Worcester when Andy Keast, the man who had brought him to Sixways, was sacked before Gomarsall even arrived at the club. Worse was to follow when one year into his contract he was called in for his annual appraisal only to be told he was surplus to requirements with concerns over his fitness and should start looking for a new club. During this difficult period he was forced to sell his house to support his family with his wife due to give birth to twins. Unhappy with his treatment by Worcester and with the backing of the Professional Rugby Players’ Association, Gomarsall took legal action for breach of contract, with the dispute eventually being settled in the high court. When Gomarsall got his P45, squads in the Premiership had been finalised and he was forced to contact clubs around Europe to look for work, even turning out for the White Hart Marauders in a pub tournament, an experience he cites as restoring his faith in the game. Fortunately, Harlequins director of rugby Dean Richards came calling after they found their scrum half resources limited upon their return to the Premiership. Richards had been a long time admirer of Gomarsall, having held talks with him back in 2000 about the possibility of moving to Leicester where he was head coach at the time. On 25/09/2006 he signed a one year “pay-as-you-play” deal at the Twickenham Stoop as he looked to get his career back on track. He was involved with the first team almost straight away after Steve So’oialo broke his hand and went on to have a successful first season for Quins, which resulted in him signing a new two year contract in April 2007. Having gained stability in his career and delivered on the pitch, he ended a two and a half year spell in the international wilderness with selection for England’s two test summer tour to South Africa ahead of the 2007 world cup in France, after incumbent England number 9 Harry Ellis suffered a serious knee injury. He started in both tests and two warm up games home and away to France, which led to his selection by then head coach Brian Ashton for his second world cup campaign. Gomarsall didn’t travel to France as England’s first choice scrum half but when given his opportunity turned in some truly world class performances. He started in three of the four group games before starting in the quarter final victory over Australia in Marseilles and semi final victory over hosts France in Paris. An England team that had been in turmoil early in the tournament defied all odds when they walked out at the Stade de France to contest the world cup final against South Africa on 20/10/2007. Gomarsall was once again in the starting XV but was unable to achieve a second winners meal as the Springboks lifted the trophy for a second time following a 15-6 victory. After over 11 years on the international scene he played his final game for England against Italy in the 2008 six nations, having amassed 35 caps and scored six tries for his country. During the 2008-2009 season Gomarsall helped Harlequins reach the Heineken Cup quarter-finals and the semi finals of the Guinness Premiership play-offs after finishing the regular season second in the table. In August 2009 Dean Richards resigned from his post at Quins in the wake of allegations of cheating in their Heineken Cup quarter final defeat to Leinster dubbed ‘Bloodgate’. Richards departure led to Gomarsall being released by the club after three seasons at the Stoop as a new coaching team took over. Now aged 35 he considered retiring with several business ventures in their infancy. However, the desire to keep on playing lead him to accept a 10 month deal with Leeds Carnegie ahead of their return to the Premiership. The move saw him reunited with his former international team mate Neil Back who was now head coach at Headingley. With a relatively young and inexperienced scrum-half division his dual role at Leeds was to help nurture the players he was fighting for the No 9 jersey with, having already performed a similar role with Danny Care at Harlequins. He helped the Yorkshire club to maintain their Premiership status before being released at the end of the 2009-2010 season. His final act as a professional rugby player saw him go full circle when he pulled on the Wasps jersey for the first time in 12 years in the inaugural JP Morgan Asset Management Premiership Rugby 7’s Series in July 2010. In a career that began at Wasps in 1993, three years before rugby union turned professional in England and four years before the introduction of the English Premiership, Gomarsall went on to play for seven clubs over a 17 year period. In the Premiership itself he played 202 times, 83 of which were for Gloucester and scored 17 tries, 12 of which were for Gloucester. He also represented the famous Barbarians FC on 15 occasions between 1996-2008, scoring 3 tries.